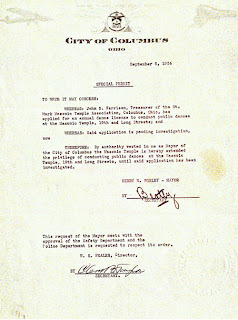 Here is a document from the historical collection of Past Master Antonio Caffey. This describes an interesting scenario. It is a "Special Permit" allowing "public dances" in the Temple. We can only surmise that as ritual work has been described as dramatic plays, some of the activity might be described as "dance" for lack of a better description. I don't know how the work was performed in the 1930's, but I can tell you I haven't experienced anything like dancing yet. 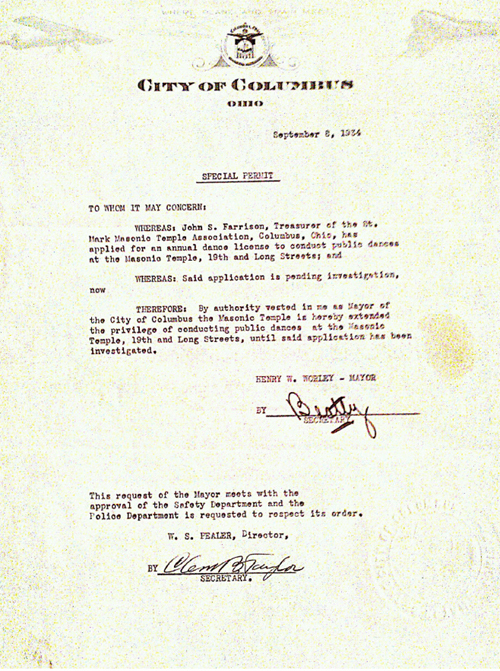 The original document is typed on a very fine onion skin paper, and is dated September 8, 1934. We are thankful to Past Master Caffey for it's preservation and presentation. It is another view into our past.